Prof. Lawrence Kaplan–who was part of the distinguished group that meet at Yarnton Manor, Oxford to discuss current theological issues–put forth his view of Maimonides on Mosaic Revelation, as expressed in prior articles that he had written. One can use Prof. Kaplan’s presentation to help in the current discussions of the origin of the Bible. Maimonides in his Guide of the Perplexed dealt with the question of anthropomorphisms. In the first chapters, the great eagle taught that all emotions and all physical movement when applied to God are not to be taken literally. God’s foot, hand, and finger are anthropomorphic; God’s anger, regret, and pleasure are anthropomorphic; and even God’s sitting, rising, looking, hearing are anthropomorphic. The second part of the Guide applies this approach to the big theological issues of creation and prophecy, how we can understand these in a non-anthropomorphic way. What does it mean to say that God spoke at Sinai? Before I specifically discuss Mosaic revelation, let me make very briefly a more general point about prophecy in general. Maimonides sought a naturalistic explanation for theological events, including prophecy. When he wrote “Know that the true reality and quiddity of prophecy consists in its being an overflow overflowing from God, may He be cherished and honored, through the intermediation of the active intellect onto the rational faculty in the first place and then onto the imaginative faculty” (G 2.36, P 369), the whole first part of this definition “an overflow overflowing from God, … through the intermediation of the active intellect” is window dressing, since it elides the fact that, for Maimonides, everything that happens in the world, for example the fact that a plant grows, is owing to an overflow overflowing from God through the intermediation of the active intellect. Thus, Maimonides in Guide 2:12 draws an explicit analogy between God’s overflow being responsible for everything that comes into existence in time and God’s overflow of wisdom onto the prophets. What is important is what the overflow perfects. The key part of the definition of prophecy then is its conclusion: “onto the rational faculty in the first place and then onto the imaginative faculty.” True, some have argued that only ordinary, non-Mosaic prophecy is naturalistic, while Mosaic prophecy is miraculous, but there does not appear to be any basis for their view. Now to Mosaic revelation. In two of my articles I have argued that Maimonides’ true esoteric position, as hinted at in the Guide of the Perplexed, regarding the origin of the Torah, the divine Law differs from his exoteric position, as set forth in the Introduction to Helek: Thirteen Principles of Faith, Eighth Principle. In the Introduction to Helek Maimonides states that Moses received the entire contents of the Torah word for word from God like a scribe taking down dictation, in the Guide he suggests, though does not state explicitly, that Moses should viewed as the author of the Torah. Briefly, Maimonides’ view, as it emerges from the Guide, is as follows. Maimonides in Guide 1:54, equates Moses’ apprehension of the attributes of action with his cognition of the cosmos. More specifically, Moses apprehended “the nature [of all existing things] and the way they are mutually connected so that he [Moses] [knew] how He [God] governs them in general and detail.” This apprehension on the part of Moses was a purely intellectual grasp of God’s governance as manifested in the scientific order of the cosmos, that is to say, to use terminology suggested by Rabbi Joseph B. Soloveitchik, of the ontological law. 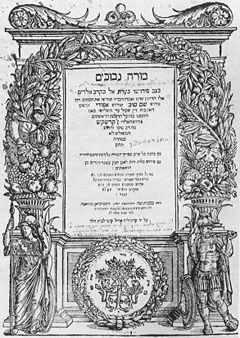 The revealed law for Maimonides, I would suggest, emerged out of Moses’ purely intellectual grasp of the ontological law. How so? To answer this let us look at the continuation of Maimonides’ discussion. Maimonides goes on to say “Scripture has restricted itself to mentioning only the thirteen characteristics although Moses apprehended … all His actions because these [thirteen characteristics] are the actions proceeding from Him …in respect to giving existence to human beings and governing them. This was Moses’ ultimate object in his demand [“Show me Thy ways”], the conclusion of what he says being `that I may know Thee … and consider that this nation is Thy people’ (Exod.33: 13)—that is, a people for the government of which I need to perform actions that I must seek to make similar to Thy actions in governing them.” Thus though Moses attained intellectual knowledge of the totality of the cosmic order (“all His actions,” “all existing things”), he was particularly concerned with the actions of the cosmic order as they impinged upon man. For Moses’ goal was to imitate the actions whereby God governed man, i.e., the thirteen characteristics, by performing actions similar to God’s and thereby governing the people. In a word, Moses’ political governance of Israel was an imitation of the divine cosmic governance of mankind. But what were the actions that Moses performed, actions that were similar to, that imitated the divine actions? Maimonides does not tell us. I maintain that, for Maimonides, the actions that Moses had to perform in governing the people similar to God’s actions in governing mankind, or to put the matter another way, Moses’ act of Imitatio Dei, par excellence, was the formulation, the legislation, of the revealed Law. That is, Moses, through an act of pure intellectual cognition, grasped the scientific functioning of the cosmos, the ontological law; he apprehended God‘s governance of all things and man in particular. Then, in a second act, Moses, using his imagination, translated that intellectual apprehension of the ideal divine pattern of governance, of the perfect ontological law of the cosmos, into ethico-political categories and produced the revealed Law. The revealed Law is thus distinct from though intimately related to the ontological law, for the revealed law is a perfect imitation in ethico-political terms of the ideal ontological law. My full argument on behalf of my position can be found in Lawrence Kaplan “`I Sleep, but My Heart Waketh: Maimonides’ Conception of Human Perfection,” The Thought of Moses Maimonides, edited by I. Robinson, L. Kaplan and J. Bauer (Lewiston, Maine, 1991), pp. 137-145, and idem, “Maimonides and Soloveitchik on the Knowledge and Imitation of God,’’ Moses Maimonides (1138-1204): His Religious, Scientific, and Philosophical Wirkungsgeschichte in Different Cultural Contexts, eds. Gorg Hasselhoff and Otfried Fraise (Ergon Verlag, 2004), pp. 491-523. And, drawing upon the epistemological ideas found in his Islamic philosophical milieu, he describes this process further in terms of active intellect’s causing the human intellect to “pass from potentiality to actuality ” (G 2.38, P 377). Prophecy is a natural phenomenon, stemming precisely from the cosmological structure of reality and the epistemological/psychological structure of human minds. The prophet is, in this context, the person whose ability to receive the overflow from active intellect is especially superb. And, following on this naturalized tradition of prophecy, there will be different levels of prophecy—as well as different levels of providence—corresponding to different levels of engagement with the overflow from active intellect. Maimonides’ view on the exact mechanics of prophecy—and the precise role, if any, of God in that mechanics—is open to scholarly debate. It is in part difficult to know for certain what Maimonides has in mind here since, as above in the case of creation, there are arguably different ways—some more naturalized than others—that one might understand Maimonides’ notion of “divine Will,” and hence, arguably different ways that one might understand the import of the above claim from 2.32. Maimonides’ esoteric approach helps him solve his problems with anthropomorphism, but does it do anything for our questions of multiple authorship? Rambam still embraces Mosaic uniqueness: no other potential author exists to whom we could assign a similar level of prophetic understanding. Rambam is said to have praised peirush Ibn Ezra in a letter to his son, urging him to study it and — I have heard — compared Ibn Ezra to Avraham Avinu. In his introduction to Tzafnas Poneach, Rav Yosef Tov Ellem describes the germination of the work: He wrote it at the urging of a Chacham in Damascus, who wanted that there be a work that explains Ibn Ezra and would demonstrate that he was not an apikorus. Tzafnas Poneach identifies this Chacham — and he turns out to be a ben achar ben of the Rambam. Question: How does one reconcile this with a narrow reading of Rambam’s eighth principle, which would seem to classify Ibn Ezra as, someone who has no share in the world to come? Surely, the Rambam would not be championing such a person to his son, nor would there seemingly be within Rambam’s family such a close affinity with Ibn Ezra’s commentary. I can think of twp possibilities, but am curious to hear what Prof Kaplan has to say. That letter is not taken as authentic. So no contradiction. And I am not sure you read the intro to Yosef Bonfils commentary. Read this article available online, it will give you the start of an approach. I have read the intro and have the sefer sitting on my shelf. I was writing from memory, but am curious to know what about it I got wrong. Both approaches make Moses, the historic figure central for Maimonides. Moses is the prophet/legislator/philosopher/leader par excellence. Much of the current discussion denies such a proposition. Does Professor Kaplan accept all of Maimonides metaphysical assumptions which presuppose his esoteric position? If one denies his metaphysical assumptions can one still sustain that position. The above read of the esoteric position of Maimonides assumes that Moses’ excellent skills governing the people are revealed in his legislative skills in the laws of the Torah. However, one could also argue that Moses governing skills were his ability to take the Israelites from Egypt and to lead the people in the desert for 40 year, independent of the written words of the Torah. This would also be consistent with Maimonides’ position about the true philosopher/prophet/leader and his leadership skills.